High quality, established heavy duty specimen plants. Fully hardy wall shrub or climber with an exotic look. Perfect for a sunny wall, trellis, fence or pergola. Produces masses of large trumpet flowers. Vibrant, tropical looking blooms. Very easy to grow even in poor soils. 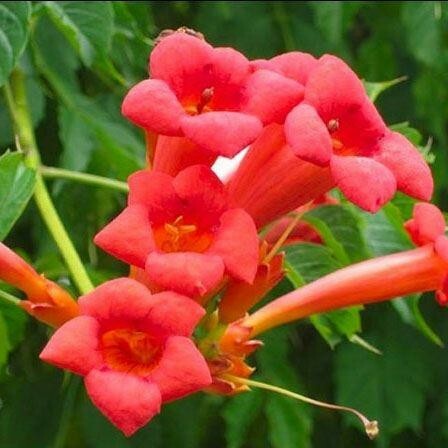 Campsis, also known as trumpet vine, is a vigorous deciduous climber that originates from woodland regions. Their bushy form adds a dimension that very few wall shrubs can offer and their exotic flowers will add splashes of colour for many weeks, giving you the feel of the exotic. Funnel shaped flowers are produced from late summer to autumn and despite its exotic appearance it's actually fully hardy. Its climbing habit makes it perfect for growing against a sunny wall, fence, trellis or through a pergola where it will fill out into an unusual specimen plant. Choose Campsis for an impactful plant that will draw the eye. Supplied in season as pictured, as large multi-branched Specimen Plants in bud/bloom trained on a trellis frame at around 80-120cms tall in approx. 5-6 litre containers. High quality, established heavy duty specimens.